The physicians of Uropartners consider robotic surgery to be an important tool in the treatment of many urologic diseases and conditions. 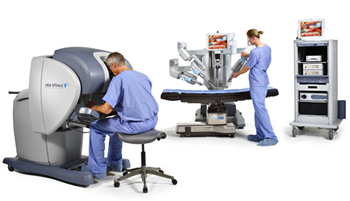 Robotic surgery is available at many of our practice sites throughout Chicagoland. Our physicians have performed hundreds of robotic surgeries for prostate, kidney and bladder cancers as well as reconstructive urologic procedures. We believe that for the appropriate candidates, robotic surgery offers optimal outcomes with decreased postoperative pain and improved recovery times. project developed for the United States military. The hope was to develop a robot that could translate the motions of a skilled surgeon allowing the surgeon to remotely operate on wounded soldiers at great distances. Despite its potential, the technology was abandoned for this purpose because of insufficient portability. Fortunately, the advanced, groundbreaking technology developed for this project was incorporated into the da Vinci System. The daVinci robot facilitates the performance of complex minimally invasive surgery by providing magnified 3D vision of the operative field and precision control of "wristed" microinstruments placed into the body through small incisions. As with any surgery, these benefits cannot be guaranteed, as surgery is unique to each patient and procedure. The daVinci Surgical System is considered safe and effective, but may not be appropriate for everyone. Always ask your doctor about all treatment options, as well as the benefits and risks. Robotic radical prostatectomy is performed for localized prostate cancer. The advantages of the robot are ideally suited to this cancer surgery. Robotic prostatectomy has become increasingly common and most prostatectomies in this country are now performed with the daVinci Surgical System. The magnified 3D vision and dexterity offered by the robot helps the surgeon remove the cancerous prostate gland while minimizing risk of injury to the delicate nerves that surround the prostate and control erections. The robot also facilitates reconstruction of the urinaty tract after prostate removal to maximize the chance of normal urinary control after the procedure. The surgeons of Uropartners have performed hundreds of robotic prostatectomies. The robot is well suited for removal of the whole kidney or part of the kidney when medically necessary, for either cancer or other noncancerous conditions. This minimally invasive approach allows for precise reconstruction of the kidney during partial nephrectomy. The minimally invasive robotic approach may be used in some patients to remove the entire bladder and surrounding tissue and lymph nodes for bladder cancer. The robot is ideal for repair of congenital ureteropelvic junction obstruction. The magnification and "wristed"ï¿½ action of the robot allow the surgeon to perform delicate suturing during this minimally invasive procedure done to relieve obstruction of the kidney. This approach uses the robot to suspend the vaginal vault in cases of severe vaginal prolapse without the need for a large incision, allowing for a more rapid recovery. Robotic lymph node dissection is a minimally invasive robotic approach to sample and remove pelvic or abdominal lymph nodes in cases of prostate or other urologic cancers. This minimally invasive robotic approach utilizes the advantages of the robot to remove an adrenal gland when necessary for cancer or other medical conditions.